The color (and related title) of the nodes is determined by a slightly different process than the location (polar mapping) one. The clustering process is agnostic to the source of the feed, and splits the individual sources into different clusters based on the similarity of words that each uses in a given query made by researchers. The clustering engine uses a simple kmeans implementation based on the cosine similarity of the list of the top 100 non-stopword query words of each media source. This approach returns a different, randomized solution each time, so we run clustering about 20 times and keep the clustering run with the highest sum of total similarity for each cluster. The title of the cluster is the most popular word within the cluster that is ranked lower than that word for all clusters (so if three clusters all have ‘Russia’ as the most popular word, none of them can use ‘Russia’ as the cluster title). The main clusters that emerge from this query are Film (green), Russia (tan/light orange), Photograph (orange), Site (light blue), and Russian (dark blue). The Russian government, TV and MSM are primarily still found near the center of the map (which is centered around the Russian government feeds), and most of the nodes are colored tan, which represents the “Russia” cluster. Although fairly overwhelming because of their numbers, we see most all of the blogs are located near the outer ring of this map, as in the previous polar maps. This is probably at least in part due to the fact that Russian popular blogs are not focused exclusively on politics. The main clusters that emerge from this query are Film (green), Russia (tan/light orange), Photograph (orange), Site (light blue), and Russian (dark blue). The Russian government, TV and MSM are primarily still found near the center of the map (which is centered around the Russian government feeds), and most of the nodes are colored tan, which represents the “Russia” cluster. Although fairly overwhelming because of their numbers, we see most all of the blogs are located near the outer ring of this map, as in the other polar maps. In the next experiment, we focused just on known political blogs (that we identified in our previous blog research, based on links), to see how different political blogs are from the government and more traditional media sources. 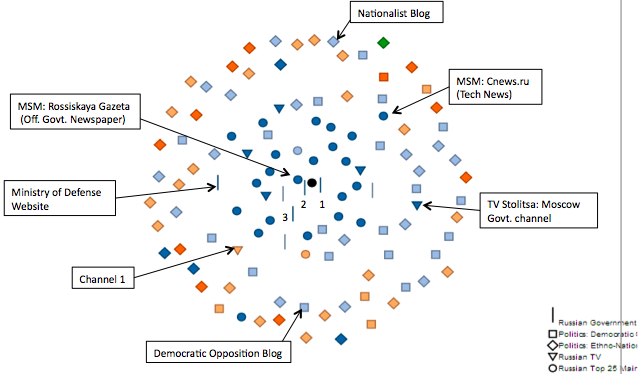 In the below polar map, we mapped the similarity of the content in Russian democratic blogs, Russian nationalist blogs, Top 25 mainstream media, Russian TV channels and Russian government Web sites, all compared to how similar they are to the Russian government feeds. 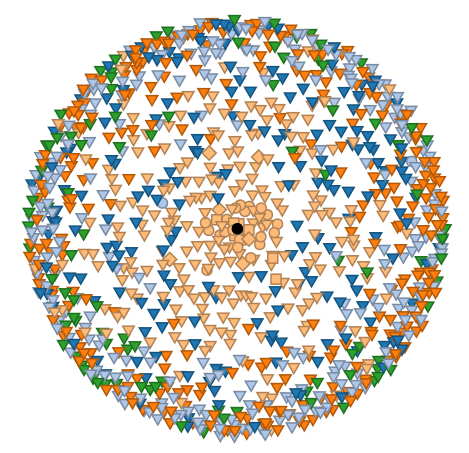 The center node, or pole around which the map is drawn, is the collective content of Russian government feeds over a two-month period (in this case, from November 29, 2010 to January 31, 2011.) Again, the further a source is from the black dot in the center, the less similar it is to Russian government feeds. An example of a democratic opposition blog is that of the Strategy 31 movement, which attempts to organize protests against the government on the 31st of each month that has 31 days, and is located in the outer ring of the map. In the above map we’ve also highlighted a typical nationalist blog. The two word clouds below show the terms used most often by each. The Strategy 31 blog preferentially uses the terms ‘freedom,’ ‘constitution’ and ‘rally (miting).’ The blog from the nationalist cluster includes nationalist language (e.g., using the word Rossiyankovo instead of Rossiskovo), as well as Chechens, Tadzhiks, Pay, Lenin, and Domodevo (the airport where a bombing blamed on Chechens took place). As one would expect, Russian government Web sites such as Kremlin.ru and Premier.ru are very close to the center. The official Russian government newspaper, Rossiskaya Gazeta, is the newspaper that is most similar to the government. It is surprising that TV channels are not that different from other news media according to our data. One would have expected TV to be closer to the Russian government than they are based on known ownership and editorial influence over TV channels, and for other online and offline newspapers to be further from the center than Russian TV. It is quite surprising to see Channel 1 as far from the center as it is, but looking at the stories coming through news feed, it seems that this is likely due to a fair number of advertisements for entertainment and other programming highlights on the channel not related to political or other news that are included in its ‘news feed.’ It is worth further investigation to see if our other news feeds capture similar promotional material for non-hard-news stories. Among the government Web sites, the Ministry of Defense is the least similar to the collective government feeds, while the official Kremlin Web site (primarily about Medvedev) and the official Russian government Web portal Government.ru appear to be the most similar to all government feeds. The mainstream news sites that are the least similar to the government are 3dnews (by a long shot, it is found in the outer blog ring) and Cnews.ru, which is explained by the heavy technology news for both sites instead of a Russian politics focus. The most similar TV channels to the government are TV Tsentra and Zvezda, a Russian military channel. Further, we also see that clustering in this map according to content shows that the mainstream media and TV sources are all clustered together in dark blue. And the word frequency cloud also shows that this group is highly focused on Russian government and politics, with ‘Russia,’ ‘President,’ ‘government’ and ‘Putin’ among the most frequently used words. These early findings seem to indicate that, for whatever reason, Russian TV channels and newspapers (traditional and Web native) cover topics similar to each other and to the Russian government. It will require more research to understand why this might be the case. However, a few theories are possible. This may also be a reflection of the dominance of two individuals over Russian politics, Medvedev and Putin. As the only two people whose decisions really matter in politics these may be the only political stories that ever get covered. However, it may be support for the theory of US media scholar Robert Entman, who argues that in the US the White House sets the news agenda, especially regarding international affairs, and Lance Bennett, who argues that the media simply index opinion of elites, including government elites, as well as the more general theories around media gatekeepers. This effect may be amplified in semi-authoritarian settings like Russia where sources of power and authority are more limited than in liberal democracies. It is also possible that we are detecting some level of self-censorship or even bias in the traditional media, caused by concerns over upsetting the Kremlin. Again, our research cannot yet say why traditional media are so similar to Russian government official information channels, simply that they are similar in the words they use, and we infer from that the stories that they cover. We are currently exploring if using word frequency counts are a good way of measuring the agenda of a given media set (what that set or individual media sources talk about). However, even if they are, this will likely not tell us what frame a given source employs (how they talk about a given issue). So, just because they both frequently talk about Putin and Medvedev, does not necessarily mean they are talking about him in the same way, which would require human coding of blog posts or automated sentiment analysis. Still, it seems that based on this early output from Russian media cloud that opposition blogs are indeed different from both government information channels and popular media, and that they are likely providing an alternative agenda to mainstream sources. More research is required to understand how these different sources talk about the same topic, and if blogs in any way have a different agenda than other media. The recent events in Egypt provide an excellent example of the appearance of an agenda item in the blogosphere that is almost completely absent from official Russian government information channels. That will be the focus of my next Media Cloud post. Yandex and Baidu are probably the most censored search engines out there. It is an utter shame that most people don’t enjoy the freedoms that we do.